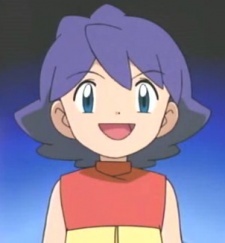 Crystal is a character from Pokémon Chronicles. She works on Sayda Island with Gary and is the younger sister of Dora. When she whistles, Pokémon such as Farfetch'd and Lapras come to her. Along with Gary, she takes care of an Aerodactyl. She assists in preventing Butch and Cassidy from stealing Aerodactyl with the help of her Ivysaur. At the end of the episode, Tracey gives her a sketch of her Ivysaur.